This article looks at wealth drawdowns for American retirees. 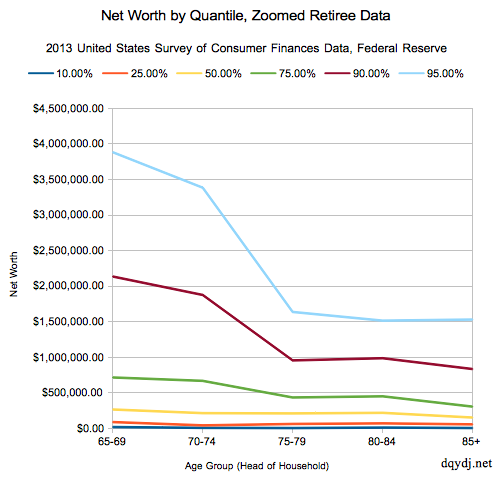 We examine net worth data for heads of households with age ranges 65-69, 70-74, 75-79, 80-84, and 85+. Seeing the average net worths of different retiree age groups gives you an idea for fund drawdown. Ideally, it also suggests a path for your own wealth drawdowns. After Retirement, How Do Americans Draw Down Wealth? This is a very interesting phenomenon to think about: at a certain point, perspective when it comes to wealth should switch from accumulation to planning on drawing down. Whether that means spending, or perhaps succession planning, or charitable and political causes, we don’t know. However, we can tell you the change in net worth for older households. We took retirees (or potential retirees) to be part of households where the head is 65 years old or older. If you’ve been following us for a while, you’ll be familiar with our methodology on handling SCF data – it is detailed in our first article in the series on how wealth doesn’t track income as well as we think it does. The number of samples, especially for older retirees, is low enough to be concerning. We only broke down the quantiles with what would roughly follow the central limit theorem, assuming we’d need around 25 samples for each. In reality, it means the 85+ and the 80-84 brackets are “pushing it”. We hope that you’ll agree that even if the numbers aren’t exact, there is enough data here to visualize drawdowns. And, really, the numbers should be decently accurate near the medians – good enough for our purposes, certainly. This data was computed using 2013 Federal Reserve SCF data from the Federal Reserve. There is definitely very clear evidence of drawdowns across a significant number of net worth brackets. It appears drawing down begins in earnest around age 70-74. With the run up in asset prices since 2009, I would expect the opposite. Not sure I know the cause – perhaps we’d have to zoom in even further to see net worth staying constant or increasing. Maybe it’s just increased spending from that demographic? I’ll be revisiting Net Worth soon to do a few pieces. Part of the net worth decline after age 70 in the 95% wealth percentile could well be due to the federal mandatory minimum withdrawal from tax-deferred savings accounts. At age 70.5 one is required to start withdrawing about 3% of your total savings in IRAs, Keoghs, 401Ks, etc. The percentage amount required to be withdrawn goes up each year with increasing age. For people in the 95%-plus bracket that amount required to be withdrawn is usually in the highest federal and state income tax bracket. So nearly 50% of that wealth that accumulated tax deferred is snatched away forever by the government. A 75 year-old with $2,000,000 in tax deferred savings accounts can count on having to give away half of his $100,000 required minimum withdrawal to government income taxes! Does net worth include all investments including home equity? It does – the default net worth measure from the Federal Reserve includes it, so we have as well. I have studied this phenomena for years. My conclusion (not based on random samples) is that people are living longer lives. As their advanced ages, their need for health care increases, in some cases cost $90,000 per year. Finally spending habits continue at the same level than prior expense level. It is a misnomer in the planning community that expenses decline leading to unexpected outcomes. We developed a an algorithm and analyzed multiple wealth levels, and your results match ours. Income levels decline with time. I’ll probably come back to this series at some point this year – this was a good piece, but I still feel I left some questions unanswered (but this is better than the previous piece which just used 65+: http://yourdayjob.net/the-net-worth-of-american-retirees-america-2013/ ).